Note: Hold-beams, wooden arches, electric light & gangways; duplicate of AVON. A.k.a. Erie & Western Transportation Co.
24 + 48 x 48", 525hp engine, H.G. Trout, Buffalo, NY (1878), 9.5 x 18' firebox boiler. 1878, Jun 26 Enrolled Erie, PA.
1890, Sep 19 Stranded LaSalle Street Tunnel, Chicago, IL. 1905, Mar 1 Owned Boland & Cornelius, Buffalo, NY; renamed WINNIPEG. 1905 Rebuilt as bulk freighter, upper deck removed; 252.5 x 35 x 15.3, 1108 gross / 874 net tons, capacity 1,500 tons; one scotch boiler 12.5 x 14' @ 110# steam, Globe Iron Works, Cleveland, OH (1888). 1906 Made steambarge, Manitowoc, WI; ran Duluth, MN & Tonawanda, NY lumber trade. 1922, Oct 21 Foundered Lachine Canal, QUE. 1923 Recovered & repaired by Canadians, owned F.P. Weaver Coal Co., Montreal, QUE, renamed WEAVERCOAL; 252 X 35 X 16', 1309 gross / 795 net tons. 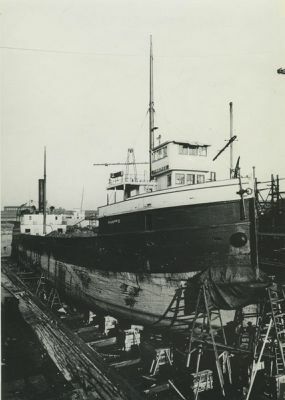 1929, Jun 7 Sunk at dock, Montreal.